If you've been a reader of my blog The Kitchen Wife you'll know that I've been working really hard at trying to clean up my eating. HOWEVER, I'm married to the King of Carnivores who feels that there should be nothing but meat and potatoes on the table at every meal. 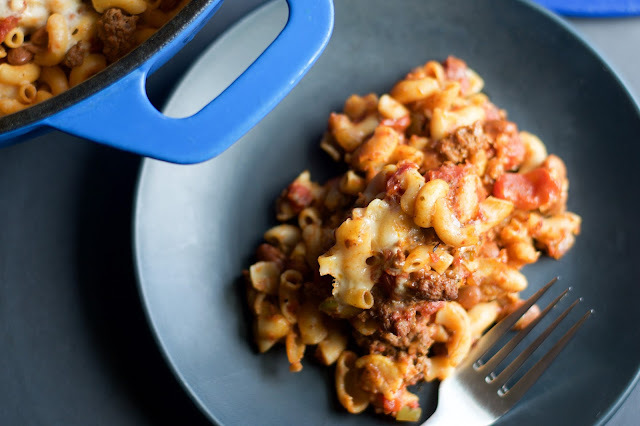 So I've been trying to take many of our family favorites and make them a little healthier. 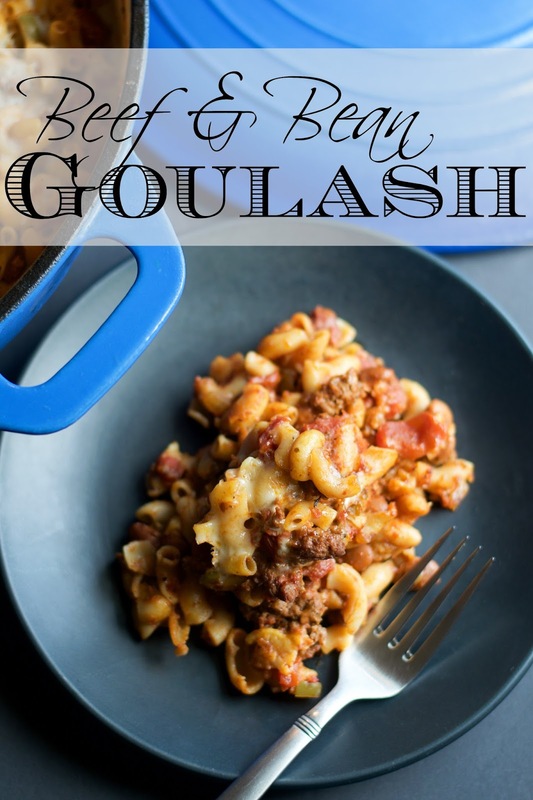 Take my Beef and Bean Goulash for Example. To begin you will need to place a deep pan over a MEDIUM/HIGH heat. Once the pan is hot add the onion, green bell pepper, and garlic. Cook 3-4 minutes until the everything is tender. Next you can add the ground beef. I will be honest with you here. If it were just for me, I would omit the meat all together, but again, King of Carnivores husband, so in the meat goes. The harrisa is a spice used in the traditional Hungarian version of this dish, and it just gives everything a little kick. Of course, if you don't have harrisa you can leave it out. it doesn't affect the recipe all that much. Cook until the meat is fully cooked and no longer pink. Once everything is at a boil you can pour in your pasta. That's right! We are going to cook the pasta right in the sauce! Don't you just love a good one pot meal!?! Stir everything together and bring to a simmer. Cover and let cook for 30 minutes, stirring occasionally. This is what it will look like after 30 minutes. You can add a little shredded cheese to the top, cover and give it time to melt. And this is what it looks like with the melted cheese! Now its time to scoop it out and you are ready to go! Place a deep pan over medium/high heat and add the onion, bell pepper, and garlic. Let cook for 3-4 minutes until everything is tender. Now add the ground beef, Italian seasoning, harissa, salt and pepper. Cook everything until the ground beef is fully cooked and no longer pink. Now add the tomatoes, beans, and bay leaf. Taste for seasoning and make any adjustments you feel it needs. Bring to a boil and add the pasta. Cover and cook for 30 minutes, stirring occasionally. After 30 minutes top with shredded cheese, cover and let the cheese melt.